Container plants are aching to grow. 2-7-11 – It has entered my radar that some gardeners are afraid of plants. Plants that they purchase, take home, and place in the ground, that is. Afraid that they’ll do something wrong during the planting process that will cause the plant to die. I understand. When I started gardening I thought every perennial I planted was a head trauma patient on life support from the moment it went into the ground until the weeks later when I perceived some small degree of added stoutness, or flush of new growth. Even then, I worried about their health at season’s end, and their chances for survival over winter. Turns out, plants are tough. My first inkling of this was the early year when I brought home six small, plastic pots of chrysanthemums. Tiny things, little sprigs, I dropped the tailgate of my pickup, set them down on the driveway apron, went inside, was asked by my wife to run to the store for something, hopped back into my truck, backed up and flattened four of the six pots with my right rear tire. Already mourning their death, I planted them out of respect, though thinking that “burial” was perhaps a better word. All flourished, of course, not only that summer but for many summers to come. A plant is aching to grow; all you need to know is proper planting technique, and understand the three simple elements comprising plant culture. Amended soil, you think? Hardly. Plants are tough. To plant potted perennials, place one hand on top of the pot with the base stem(s) of the perennial between your middle and ring fingers, turn the pot upside down, and shake it out. Should the plant slip from your fingers and fall to the ground, kick at it, to break its fall. Don’t worry—you cannot harm the plant. Should you be planting a roof garden and the plant slips from your fingers, you kick at it, connect, and send the plant flying over the edge of a two-story building, landing, plant-side-down, on an asphalt driveway, breaking off most or all of the plant at the base, plant it, and it will send up new growth—you cannot harm the plant. If you didn’t drop the plant, rough up the root ball until a majority of the exposed roots are hanging loose. If the exposed roots are not much longer than the pot, and growing neatly down the sides, tear at them with your fingers (gloves just get in the way). If the roots are circling the soil and have grown thick around the bottom, place the plant on the ground and slice off the bottom inch of the root ball with a knife, as if slicing the heal from a loaf of bread. Next, score the sides of the ball three or four times, an inch or two deep, from top to bottom. Use a knife or the top cutting blade of your bypass pruner. 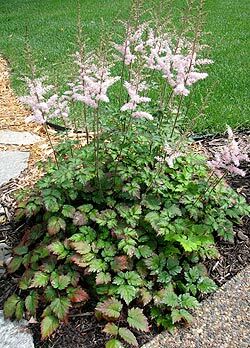 One-gallon Astilbe ‘Color Flash’ second season after planting. If you are too gentle performing any of the above, or too ruthless performing any of the above, the perennial will grow just fine—you cannot harm the plant. Perennials usually come in a one-gallon container, also called an eight-inch container. To plant, dig a hole that is three times the width of the pot, and as deep. Loosen the soil three to four inches deep at the bottom of the hole. Place the perennial in the hole, adjusting the soil at the bottom so that the top of the soil in the pot is level with the ground. Add the soil back around the plant, and pat it lightly around the base of the perennial. Circle the plant with a small handful of all-purpose granular organic fertilizer, scratch it in, then water the plant well. To plant bare-root perennials (which you may receive if ordering from a catalogue), dig a hole eight inches deep by eight inches across, toss the soil back in, and chop it up the with the shovel. Scoop out a bit of the soil with your hands, and place the roots into this small hole, spreading them out evenly. Cover the roots completely with soil, pressing the soil down firmly over the roots and around the base of the plant, then fertilize and water. If the roots appear dry, brittle, lifeless, if some break while spreading, do not worry—you cannot harm the plant. 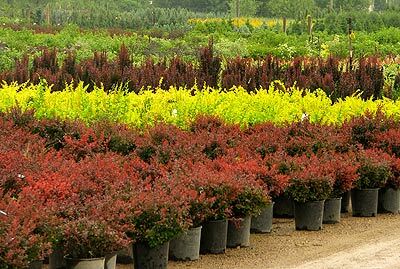 Container shrubs are treated the same; pretend they are big perennials. 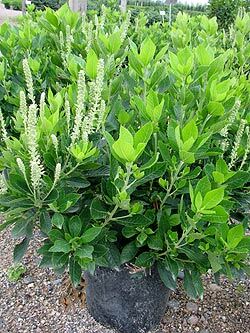 This is important: A shrub might have a good side and a bad side (particularly evergreen shrubs). At the very least, one side will look best. While it’s still in the pot, spin the shrub to settle in on what you think is the best side (same as you do with a Christmas tree). A number 5 container is the most common container size, just a bit smaller than a five-gallon pail. You grab the shrub around the base with one hand, lift it about two feet in the air, then strike the top edge of the container with the heel of the palm of your other hand, hard, working around the rim, until the container falls off. Try not to break base branches, but if you do, new ones will grow—you cannot harm the plant. If the container won’t budge, the roots have expanded in the pot and you need to place the container on the ground, then cut the sides of the container from bottom to top with a box cutter or other razor blade-type device, twice, across from each other. Then pick the shrub up and knock the container off. You’ll see a lot of roots, intricate mosaics of them. Score the roots from bottom to top an inch deep with a blade, about every three inches or so. Be sure to jab at and rip away the roots at the shoulders of the root ball—the top edge. Rip and tear and score and jab until the roots are hanging out from the soil. 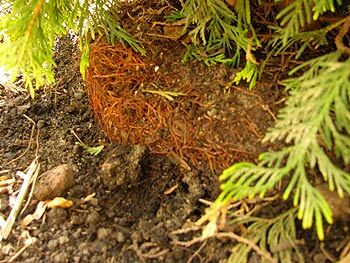 If there are a lot of roots circling at the bottom, lay the root ball on its side and slice off the bottom two inches. Be ruthless—you cannot harm the plant. Dig a hole twice the diameter of the container (we’re assuming decent soil here) and as deep. Chop at the soil at the bottom of the hole. Make a little mound of soil in the center of the hole: this ensures that the center bottom of the root ball has good contact. Adjust this mound until the shrub, when placed back in the hole, is at the proper height—top of the soil that was in the container level with the ground. Remember to place it so the good side is the one viewed. 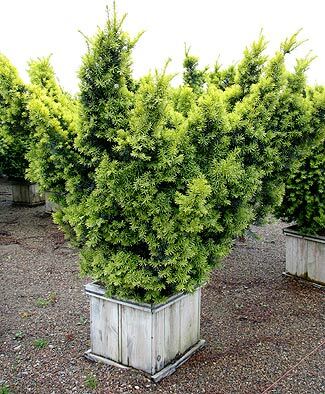 ‘Dwarf Bright Gold’ Yew in a number 25 box container. You cut the black plastic bands with a side cutter and take the box apart with a pry bar. Big tip: Before shoveling the soil back in around the shrub, shovel the hole bigger. Place your shovel tip about three inches outside the edge of the hole and push it in straight down with your foot. Pull the handle back at you and break that soil loose into the hole. Do this all the way around the hole. Then move out another three inches and break that soil up all the way around the newly widened hole. (A form of “double-digging, for you old-timers.) Chop at the soil if compacted, to loosen it up. Your shovel blade probably is not going all the way down as deep as the original hole, but you are further loosening up the soil around the shrub to a depth of eight to ten inches. Then you add the soil from the hole back around the plant and smooth it level with your gloved hands. By double digging six inches out around the original hole, you’ve just made the hole a foot wider without having to have dug it that wide initially. Follow? When my crew and I are out planting shrubs, the guys know that after they get bored with planting after an hour, they can grab the hose and watering wand and water everything they’ve planted so far. They work the wand around each shrub and work it out to the edge of the planting hole and really soak the plant in. Keep in mind we might be planting ten shrubs and a couple big trees in a few hours, or sixty shrubs and ten trees over two days. I tell them to take a break from digging and water what they’ve planted within an hour of planting. We soak everything pretty good. Here’s an evergreen shrub root ball with exposed shoulders and sides after the initial watering. FYI, my guy could have sliced up those shoulder roots a bit more. We add more soil to cover them, water lightly, then mulch. Then, before we mulch, we check every plant. What I mean is we examine the base of the shrub to see if we have any exposed shoulders. And we will. The heavy initial watering will cause the loose soil to slump a bit in the hole, and if you pull the base branches out of the way you’ll discover sometimes that a shrub has exposed roots at the shoulders and even a few inches down the side. The shrub is at the correct level, but the soil has slumped. These exposed roots are going to dry up and die, and the shrub will stumble from the gate. So you grab a few shovelfuls of dirt and bring the soil back up to level. Water the new soil lightly, then mulch around the shrubs with two to three inches of shredded hardwood mulch, but only up to the drip line, not underneath the base branches. NOTE: For the full primer on how to plant BB trees, click here. Learning plant culture simply means learning three things about the plant: its sunlight preference, soil preference, and moisture preference. Does the plant prefer full sun, part sun, or some degree of shade? That information is usually on the plant tag. If not, ask at the nursery, research the plant online, buy a book. Then plant it accordingly. Next is soil preference, and for perennials, that’s pretty simple. Ninety-five percent of the perennials you wish to grow need decent garden soil, which means it crumbles when dry, contains five to ten percent organic material, and drains fairly well. If that’s not your soil, you need to amend it, which means adding organic material such as peat moss and compost. Same goes for shrubs. Last one is moisture preference—how often do you water the thing? Again, this is often noted on the plant tag. If not, ask at the nursery, or do a bit of research. In general, water new perennials deeply, once a week. Water newly planted trees and shrubs every five days. Use a watering wand; watering with the end of a hose displaces the soil. Water the soil around the base of the plant, not the plant. Assuming decent hose pressure and soil that drains fairly well, ten seconds around each perennial does the job. This watering rate works for a majority of your perennials. 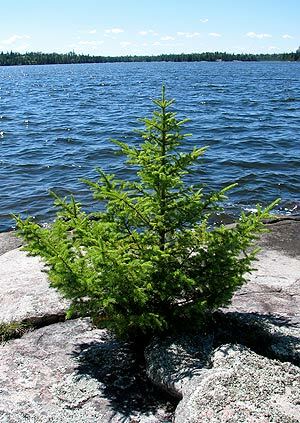 The water hangs around for a few days so the plant can draw it up, then the roots get a little dry time (although “dry” is relative—the soil is never truly dry). If you’ve learned the perennial prefers soil kept a bit moist (ligularia, astilbe, tiarella) water them every five days or so. Shrubs in number 5 containers need about three gallons every five days. Shrubs in larger containers, and evergreen shrubs, would like about five gallons. Large deciduous and evergreen trees in large containers need ten gallons every five days. Trees that are sold BB (ball and burlap) need 15 gallons. These watering rates are for the first season in the ground and are assuming the soil retains moisture. In sandy soils you should water ever two to three days, although why you planted new trees or shrubs in sandy soil without first adding copious amounts of organic matter is beyond me. So how long do you water each time? Time how long it takes to fill a five-gallon pail with your watering wand at full water pressure. One minute? OK, it takes one minute to deliver five gallons of water with your wand. Three minutes, fifteen gallons. Most important, don’t ruminate too closely on any of the above. Get it mainly right, and your perennials, shrubs and trees will take it from there.